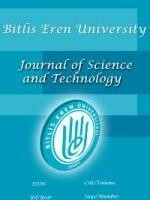 ABSTRACT: The chemical composition of the essential oils of dried aerial parts of two Teucrium species were analyzed by GC and GC-MS. The essential oils of two Teucrium species were studied and eighty components, in all, were identified representing (90.8%) and (82.4%) of the oils respectively. The oil of Teucrium polium L. subsp. polium is characterized by the monoterpene b-pinene (10.2%) and the sesquiterpene germacrene D (10.1%), while that of Teucrium multicaule Montbret Et Aucher Ex Bentham had a higher contents of sesquiterpene caryophyllene oxide (31.1%). Quantitative and qualitative variations were determined in the essential oil composition of different parts of the studied plant. The high amount of monoterpenes α- and β-pinene and the sesquiterpene germacrene D, caryophyllene oxide make the studied taxon a privileged potential source for pharmaceutical, cosmetic and industrial products. References Abdollahi, M., Chan, T., Subrahmanyam, V., and O’Brien, P., 2003. Effects of phosphodiesterase 3, 4, 5 inhibitors on hepatocyte CAMP levels, glycogenolysis, gluconeogenesis and susceptibility to a mitochondrial toxin. Mol. Cell. Biochem., 252, 205 211. Bagci, E., Yazgin, A., Hayta, S., and Cakilcioglu, U., 2010. Composition of the essential oil of Teucrium chamaedrys L. (Lamiaceae) from Turkey. J Med Plants Res., 4, 2588–2590. Bagci, E., Hayta, S., Yazgin, A., and Dogan, G., 2011. Composition of the essential oil of Teucrium parviflorum L. (Lamiaceae) from Turkey. J Med Plants Res., 5, 3457–3460. Baser, K.H.C., Demircakmak, B., and Duman, H., 1997. Composition of the essential oils of three Teucrium species from Turkey.’’ J. Essent. Oil Res., 9, 545- 549. Ben Sghaier, M., Chraief, I., Skandrani, I., Bouhlel, I., Boubaker, J., Kilani, S., Neffati, A., Mahmoud, A., Hammami, M., Chekir-Ghedira, L., and Ghedira, K., 2007. Chemical composition and antimicrobial activity of the essential oil of Teucrium ramosissimum (Lamiaceae). Chem. Biodivers. 4, 1480-1486. Cakir, A., Duru, M.E., Harmandar, M., Ciriminna, R., and Passannanti, S., 1998. Volatile constituents of Teucrium polium L. from Turkey. J. Essent. Oil Res., 10, 113-115. Cavaleiro, C., Salgueiro, L.R., Antunes, T., Sevinate-Pinto, I., and Barros, J.G., 2002. Composition of the essential oil and micromorphology of trichomes of Teucrium salviastrum, an endemic species from Portugal. Flav. Fragr. J., 17, 287-291. Cozzani, S., Muselli, A., Desjobert, J.M., Bernardini, A.F.O., Tomi, F., and Casanova, J., 2005. Chemical composition of essential oil of Teucrium polium subsp capitatum (L.) from Corsica. Flav. Fragr. J., 20, 436- 441. Davis, P.H. 1982. Flora of Turkey and the East Aegean Islands, Edinburgh University Press, Edinburgh, UK, vol. 7, 544–547. Dogan, M., 2008. Elaziğ ili Ve Çevresinde Teucrium polium Türünün Göstermis Oldugu Morfolojik ve Kimyasal Varyasyon. F.Ü. Fen Bilimleri Ens. Yüksek Lisans Tezi. Galati, E. M., Mondello, M. R. D., Aquino, A., Miceli, N., Sanogo, R., and Tzakou, O., 2000. Effects of Teucrium divaricatum Heldr. ssp. divaricatum decoction on experimental ulcer in rats. Journal Ethnopharmacology, 72, 337–342. Güner, A., Akyıldırım B., Alkayış M.F., Çıngay B., Kanoğlu S.S., Özkan A.M., Öztekin M., and Tuğ G.N., 2012. Türkiye Bitkileri Listesi (Damarlı Bitkiler). Nezahat Gökyiğit Botanik Bahçesi ve Flora Araştırmaları Derneği Yayını. İstanbul. Hachicha, S.F., Skanji, T., Barrek, S., Ghrabi, Z.G., and Zarrok, H., 2007. Chemical Composition Teucrium alopecurus essential oil from Tunusia. Flavour Frag. J., 22, 101-104. Hisham, N., Pathare, S., Al-Saidi and Al-Salmi, A., 2006. The composition and antimicrobial activity of leaf essential oil of Teucrium mascatenses Boiss. from Oman. J. Essent. Oil Res., 18, 465-468. Javidnia, K., and Miri, R., 2003. Composition of the essential oil of Teucrium orientale L. ssp orientale from Iran. J. Essent. Oil Res., 15, 118-119. Javidnia, K., Miri, R., and Khosravi, A.R., 2007. Composition of the essential oil of Teucrium persicum Boiss. from Iran. J. Essent. Oil Res., 19: 430-432. Kabouche, A., Kabouche, Z., Ghannadi, A., and Sajjadi, S.E., 2007. Analysis of the essential oil of Teucrium polium ssp aurasiacum from Algeria. J. Essent. Oil Res., 19, 44-46. Kucuk, M., Gulec, C., Yasar, A., Ucuncu, O., Yayli, N., Coskuncelebi, K., Terzioglu, S., and Yayli, N., 2006. Chemical composition and antimicrobial activities of the essential oils of Teucrium chamaedrys subsp. chamaedrys, T. orientale var. puberulens and Teucrium chamaedrys subsp. lydium. Pharm. Biol., 44, 592-598. Mabberley, D.J., 1997. The Plant Book. A Portable Dictionary of the Vascular Plants Cambridge University Press, Cambridge. Morteza-Semnani, K., Akbarzadeh, M., and Rostami, B., 2005. The essential oil composition of Teucrium chamaedrys L. from Iran. Flav. Fragr. J., 20, 544-546. Pala-Paul, J., Perez-Alonso, M.J., Velasco-Negueruela, A., GarciaJimenez, N., Jimenez, R.G., and Vargas, L., 2001. Composition of the essential oil of Teucrium carolipaui Pau grown in Spain. J. Essent. Oil Res., 13, 452-453. Polat, T., Özer, H., Öztürk, E., Çakir, A., Kandemir, A., and Demir, Y., 2010. Chemical Composition of the Essential Oil of Teucrium multicaule Montbret Et Aucher Ex Bentham from Turkey. J. Essent. Oil Res., 22(5), 443-445. Said, O., Khalil, K., Fulder, S., and Azaizeh, H., 2002. Ethnopharmacological survey of medicinal herbs in Israel, the Golan Heights and the West Bank region. Journal Ethnopharmacological, 83, 251–265. Salah, K.B.H., Mahjoub, M.A., Chaumont, J.P., Michel, L., Millet-Clerc, J., Chraeif, I., Ammar, S., Mighri, Z., and Aouni, M., 2006. Chemical composition and in vitro antifungal and antioxidant activity of the essential oil and methanolic extract of Teucrium sauvagei Le Houerou. Nat. Prod. Res., 20, 1089-1097. Saroglou, V., Arfan, M., Shabir, A., Hadjipavlou-Litina, D., and Skaltsa, H., 2007. Composition and antioxidant activity of the essential oil of Teucrium royleanum Wall. ex Benth growing in Pakistan. Flavour Fragr. J., 22, 154-157.